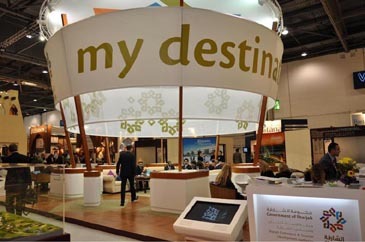 Sharjah stand attracts many tour wholesalers as well as retailers during WTM 2008 in London. Sharjah, one of the emirates of the United Arab Emirates (UAE),is planning to add over 5,000 new hotel rooms in the next two years, increasing the total number of hotel rooms to 12,000 rooms by 2010, according to Emirates News Agency(WAM). Speaking of the expected growth in tourism sector during the coming years on the sideline of the World Travel Market (WTM) held in London Nov.11-13, 2008, Mohamed Al Noman, Director General of Sharjah Commerce and Tourism Development Authority (SCTDA), said : "In order to accommodate the increasing number of tourists visiting Sharjah, the emirate is gearing up to increase hotel capacity, and is continuing to attract world-renowned hotel brands. ''Over 5,000 new hotel rooms will be added in the next two years, increasing the total number of hotel rooms to 12,000 rooms by 2010,''he unveiled. 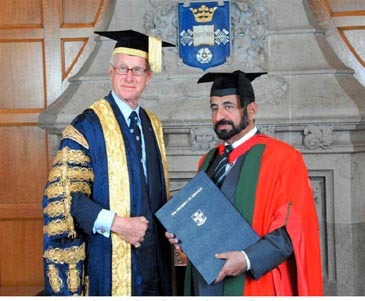 Sharjah ruler gets the doctorate degree in Sheffield British University. He stressed the importance of Sharjah's involvement in WTM and the key role played by the SCTDA in organizing the emirate's participation in the world-leading expo. "At a time when Sharjah is emerging as a favorable destination for international tourists, promoting the emirate as a world-class destination on the international tourism map has become SCTDA's main concern. With this in mind, the SCTDA has undertaken many activities that are now beginning to attract much local, regional and international interest. ''We utilize our presence in international platforms to highlight the tourist attractions in Sharjah. These efforts have borne fruit, and Sharjah has had a strong presence at WTM over the last four years," he said. Sharjah's participation in this year's WTM builds on the tremendous success it achieved at WTM 2007, where the emirate's stand was a magnet for the attention of the international tourism community. As with all its previous international participations, the authority was keen to provide accurate information about the emirate, and distributed English language publications to visitors. WTM is one of the world's premier annual business-to-business travel and tourism gatherings and one of the top five international travel and tourism exhibitions. It is a prestigious networking event for key international travel and tourism players who meet to discuss ways to enhance cooperation among their countries. Last year's exhibition attracted over 49,000 visitors from 202 countries, with figures expected to increase by around 10% this year. Day one of the World Travel Market (WTM) 2008 exhibition saw the stand promoting the emirate of Sharjah attracting the attention of the tourism community, participants, organizers and visitors, as well as a number of VIPs. H.E. Sheikh Sultan Bin Ahmed Al Qassimi, Chairman of SCTDA, was on hand to receive VIPs who visit Sharjah's stand at one of Europe's premier tourism events. The VIPs included a number of CEOs of large travel and tourism agencies, heads of delegations, ambassadors and elite businessmen. This year marks Sharjah's fifth participation in the 29th WTM exhibition. The Sharjah delegation's official representatives to the exhibition met with their European and UK counterparts to discuss tourism cooperation strategies, at a time when the emirate is emerging as a destination of choice for European tourists. The second day of Sharjah's 5th participation in the World Travel Market 2008 (WTM 2008) was a great success, judging by the attention the emirate's stand received from both international and Arabic media, as well as from visitors to the show, particularly those in the tourism and travel industry. The British media was keen to cover the Sharjah stand's activities and shed some light on the tourist attractions in the emirate, particularly the cultural and heritage aspects that distinguish Sharjah from other areas in the region and are considered the most prominent attraction factors for British and European tourists. Sheikh Sultan Bin Ahmed Al Qassimi, Chairman of SCTDA, said to the British media that the number of tourists flowing into Sharjah is projected to reach 3.5 million by 2012 due to the rapid growth experienced by the tourism sector over the last five years. "While tourism is today one of Sharjah's greatest revenue sources, the emirate intends to launch further tourist ventures and construct tourist cities and villages to attract both tourists and investors to the emirate. The promotional campaigns organized by the SCTDA have also played an important role in bringing visitors and tourists into the emirate," Al Qassimi said. "The tourism sector makes up a significant part of Sharjah's gross domestic product, as well as that of the UAE. In 2007, the sector saw a remarkable rise in the volume of tourists entering the emirate, with the total number reaching 1.5 million. Meanwhile, the number of passengers via Sharjah Airport surged up to 4.5 million, an increase of 47 percent compared to 2006, when the number of passengers was 3.06 million," he added. Al Qassimi said that the tourism sector in Sharjah is considered today one of the emirate's most effective economic sectors, and that it holds much interest for many international organizations and institutions. Figures show that Sharjah has become a tourist hub for visitors from around the world, due to the many tourist attractions available in the emirate, which is full of historic places and enjoys a moderate climate and wonderful natural environment. Commenting on the impressive attendance at the emirate's stand for the second consecutive day at one of the world's most prominent shows in the tourism and travel sector, Mohamed Ali Al Noman, SCTDA's Director General, said that the large number of people visiting the emirate's stand confirm the importance of Sharjah's tourist product, which has increased the number of tourists influx into the emirate by 100 per cent over the last five years. "Sharjah is keen to underline the interactive relationship between the development of infrastructure and diversification of tourist and commercial attraction factors. This will bring profit and other advantages to the national economy," Al Noman said. "Through continuous follow-up by SCTDA's chairman, we have worked hard to take advantage of all facilities and employ all potentials to realize the sought-after aims of tourist promotion in Sharjah. We believe that our participation in such international events as this, WTM 2008, will lead to economic development for the emirate, through which it will emerge as a prime example of what can be achieved by mixing modernism and traditionalism," Al Noman added. He concluded his statement by saying, "Our success today pushes us to ever greater efforts in order to realize the goal for which the SCTDA was created, and will be the best materialization of the emirate's policy, which aims to make use of all available potentials to achieve real development for the tourist sector." Sharjah delegation to WTM 2008 is led by Sheikh Sultan Bin Ahmed Al Qassimi, Chairman of the SCTDA and includes members from various Sharjah authorities, including the SCTDA, the Al Qasba Development Authority, the Sharjah International Airport Authority, the Sharjah Museums Department, the Radisson SAS Resort, the Coral Beach Resort, the Marbella resort, the Oceanic Hotel KF, the Millennium Hotel and the Orient Tours. The number of hotel visitors in the UAE emirate of Sharjah totalled 1,152,181 up to the end of September 2008, compared to the 2007 figure of 1,022,985 for the same period, a 13% rise. The total number of hotels and hotel apartments in Sharjah rose to 103, including 37 hotels and 66 hotel apartments, compared to 74 in the same period of 2007, including 24 hotels and 50 hotel apartments. Sharjah has registered 75 per cent growth in its hotel occupancy for the third quarter of 2008, with an increase of 13 per cent in the number of tourist visiting the emirate. The increase in Sharjah's hotel occupation rates and the number of hotel institutions forecasts impressive tourism performance for the year, as can be seen from what had been achieved by the end of September. Al Noman said that the tourism market has witnessed rapid growth due to the new strategies drawn up by the SCTDA since the beginning of 2008, pushing us to even greater efforts to follow development and provide better promotion of the emirate. The SCTDA's statistics reveal that European visitors make up the greatest number of tourists who entered the emirate until the end of September, accounting for 33 per cent of the total number of tourists. GCC tourists come second at 29 per cent, and Asian tourists third at 20 per cent. Tourists from the remaining Arab states formed 13 per cent, while visitors from Commonwealth, American, African and Pacific states accounted for 5 per cent. Sharjah is one of the emirates of the United Arab Emirates (UAE). The emirate covers 2,600 km and has a population of over 800,000 (2008). The emirate of Sharjah comprises the city of Sharjah, and other minor towns and enclaves such as Kalba, Hisn Dibba and Khor Fakkan. Historically, Sharjah was one of the wealthiest towns in this region with a settlement in existence for over 5000 years. On 8 January 1820, Sheikh Sultan I signed the General Maritime Treaty with Britain, accepting a protectorate to keep the Ottoman Turks out. Like four of its neighbours, Ajman, Dubai, Ras al-Khaimah, and Umm al-Qaiwain, its position on the route to India made it important enough to be recognized as a salute state. On 2 December 1971, Sheikh Khalid III joined the United Arab Emirates.